You can't say a lot about the Zorki-C and its brother the Zorki 2C both are based on the good old Zorki 1. The differences are very simple. KMZ added a flashsync to a zorki 1 and called it the Zorki-C. They changed the flashsyncspeeds a bit, added a self timer and called it the Zorki 2C. Please note that not all C's or 2C's have a selftimer. Where the Zorki 1 had a certain pizzaz and style. The Zorki C and 2c have lost it. 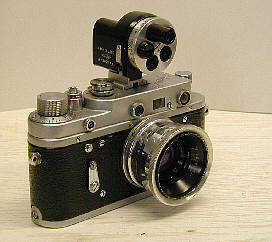 The Zorki 1 being almost an exact copy of the Leica II was a delightfull looking camera. Not only succeeding in being a Leica wannabe but outproducing Leica aswell. But then they added the flashsync and it became a more brick looking camera. Which doesn't mean that it is a bad camera. Far from it. Both are very good rangefinders. The right Zorki 2C has been equipped with a Jupiter 12 35mm wide angle, which is one of the best lenses I own and to top it off a universal rangefinder correcting paralax errors. I use it to shoot straight. KMZ even introduced some special versions. There are Zorki C's and 2C's with green and grey leatherette. On the Zorki C some are engraved "Festival" after the Moskow Youth Festival from 1957 (note that this is on Zorki C's from 1956 and 1957 only). 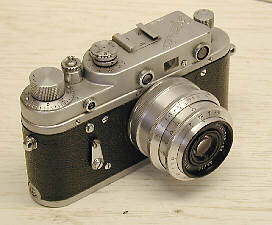 Though they are very good and sturdy rangefinders they lost the touch of the Zorki 1. But KMZ refound the "touch" in the Zorki 3 and 3M. But lost it again in the series 4. Which allthough being great usercams just missed that little bit of extra character. But in defence of the Zorki C, 2C and the series 4 (read Zorki 4) they make good usercams. And to own one is to use one.